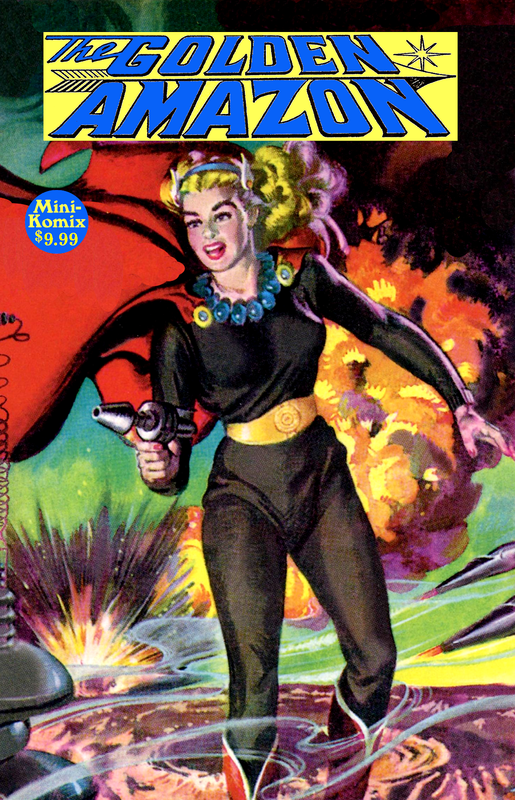 One of the most influential stars of science fiction, John Russell Fearn's Golden Amazon featured in numerous British and Canadian pulp magazines, who eventually got her own series of novels. Created as the first genuine superhuman, Violet Ray raised herself using her superior strength and intelligence to conquer the world, but eventually became mankind's interstellar savior as the "Golden Amazon". In this story, an invasion by alien lizard men leads to the Earth's sun slowly starting to burn out. Only the Golden Amazon along with an Atlantean prince from Jupiter can save the galaxy with their advanced technology. This full-sized paperback is available for download and print at Drive Thru Comics and Indy Planet.